Feathered Quill Book Reviews: New Dahl Book! Miranda Mary Piker, described by author Roald Dahl as “a horrid little girl who was disgustingly rude to her parents and also thoroughly disobedient,” is one of several “nasty children” who didn’t make it into the final version of Charlie and the Chocolate Factory when it was published in 1964. Fans can make her acquaintance at last in The Missing Golden Ticket and Other Splendiferous Secrets, which includes “Spotty Powder,” the deleted chapter featuring Miranda. Due from Puffin next month with a 75,000-copy first printing, the book also contains biographical and autobiographical tidbits about Dahl’s life and writing, as well as art by Quentin Blake. 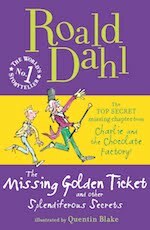 The Missing Golden Ticket and Other Splendiferous Secrets was published in the UK in May, to coincide with Puffin UK’s 70th anniversary. Its publication date in the U.S. is also timely, as the publisher is celebrating its fourth annual Roald Dahl Month in September. The author would have turned 94 on September 13. Penguin's poster for Roald Dahl Month. To celebrate this month-long promotion, Penguin Young Readers Group has created a calendar poster with suggestions for daily activities to commemorate Dahl, including a recipe for “James and the Giant Peach juice” and a wear-something-yellow day in honor of the author’s favorite color. The flip side of the poster contains reproducible bookmarks and word games based on various Dahl novels. This year, the publisher is expanding its Dahl promotion with the Roald Dahl Reading Dahlathon, a reading challenge for kids ages seven to 13. Kicking off in September and running through December, the program encourages kids to read three of the author’s books during that time frame. Participants can track their reading progress in the Dahlathon Official Reading Journal, available at bookstores and libraries or online at [dedicated Web site]www.roalddahl.com/dahlathon. A Reading Dahlathon easel with 20 copies of the journal and the calendar poster were included in merchandising kits distributed to booksellers and librarians. After completing three books, kids can mail to the publisher an entry form (found in the journal) to receive a certificate and a free book. The first 1,000 participants to do so will also be sent a Reading Dahlathon medal. Booksellers, teachers, and librarians who e-mail a photo of a Roald Dahl event they’ve hosted between September and the end of December will be entered in a sweepstakes to win one of 20 $100 prizes to put toward a pizza party. My kids love Roald Dahl. I look forward to purchasing this book for them. Thanks for the heads up!